In support of World TB Day on March 24, the Forum of International Respiratory Societies (FIRS) urges action on five united strategies to ensure that the aim of ending tuberculosis (TB) by 2030 is achievable, despite new and emerging challenges. TB is one of the world’s most pressing health challenges and one of the top 10 causes of death — yet it is a treatable and curable disease. In 2015, there were 10.4 million new TB cases worldwide, and 1.8 million people died of TB. In the same year, 480,000 patients developed multidrug-resistant TB — now a recognized public health emergency and a statistic that is predicted to rise still further. 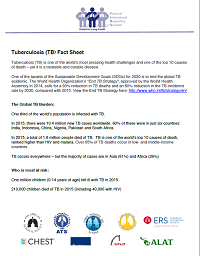 TB remains an important preventable cause of childhood death and morbidity; in 2015, one million children developed TB while 210,000 children died of TB. TB is the leading killer of people with HIV — 35 percent of deaths among HIV-positive people are directly due to TB infection.